They have a range of floral signs handmade hanging with pretty ribbon, slogans include ‘I believe in Fairies‘ and ‘Boudoir’. 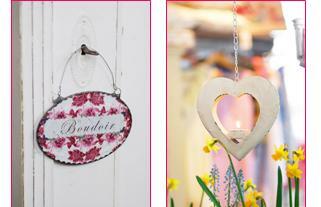 I also love the hanging heart perfect for hanging outside your french doors. For those that love vintage they have a great range of ennamel pots & jugs.